Gregg Eichhorn is the father of nine adopted children, eight of whom live with physical or mental disabilities. 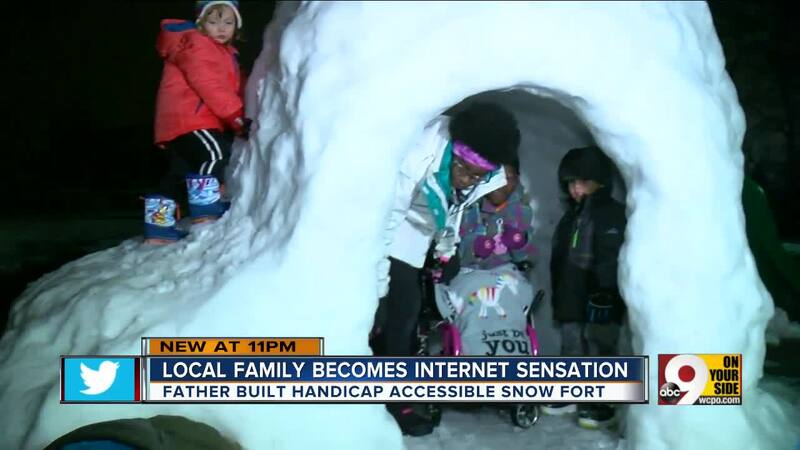 When they began building the snow fort, they wanted to make sure everyone could play inside. That meant widening the entrance so 19-year-old Zahara and 11-year-old Elijah, both of whom use wheelchairs, could comfortably get inside. The 10-foot snow fort outside Gregg Eichhorn’s Cincinnati home began as an igloo and grew into an opportunity to show thousands of strangers the importance of making sure all kids can enjoy their childhoods equally. Eichhorn is the father of nine adopted children, eight of whom live with physical or mental disabilities. When they began building the snow fort, they wanted to make sure everyone could play inside. That meant widening the entrance so 19-year-old Zahara and 11-year-old Elijah, both of whom use wheelchairs, could comfortably fit. “We just really want to be super inclusive and want them to have the good parts of our childhood that we had as well,” Eichhorn said Thursday night. Elijah has cortical vision impairment, a type of sight dysfunction caused by brain injury. When his siblings brought him into the fort, 11-year-old sister Kimora said, something unusual happened: He opened his eyes and looked around. His family believes that’s proof positive he was having a good time and enjoying a new experience. It’s also validation of the five hours they spent building it, Kimora said. A family friend posted Eichhorn’s grinning pictures of Zahara, bundled in a pink tartan parka to match her pink wheelchair, to Reddit on Monday. By Thursday night, they had earned more than 71,000 up votes and 951 comments from users whose hearts were warmed by the chilly scene. “A castle worthy of a Princess!” one wrote, punctuating the message with sparkle, crown and heart emojis. “what a fortful thing to do,” another posted. Eichhorn said he was surprised but gratified by the attention, which he hopes will encourage others to think about becoming adoptive parents and helping give other children happy days like Zahara and Elijah’s.